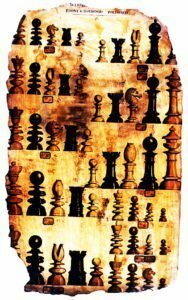 Offered here is a set of Northern Upright Library Chessmen crafted from Bone. The design varies somewhat from the more traditional Northern Upright designs in that the column is more elegant and somewhat urn shaped. The King stands 2-7/8″ tall with a 1.3″ diameter base. 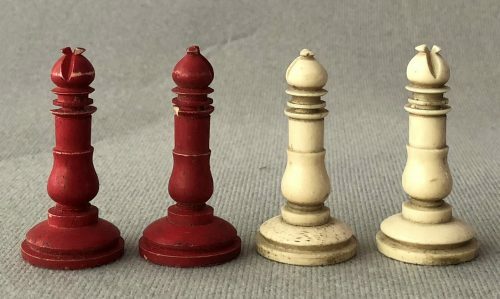 These English bone chess pieces have a very desirable antiqued appearance. The chessmen are unweighted and unfelted, which is very typical for antique Bone and ivory chess pieces, This style of chessmen was common in the early and mid-Victorian Period and dates to the 1840s. 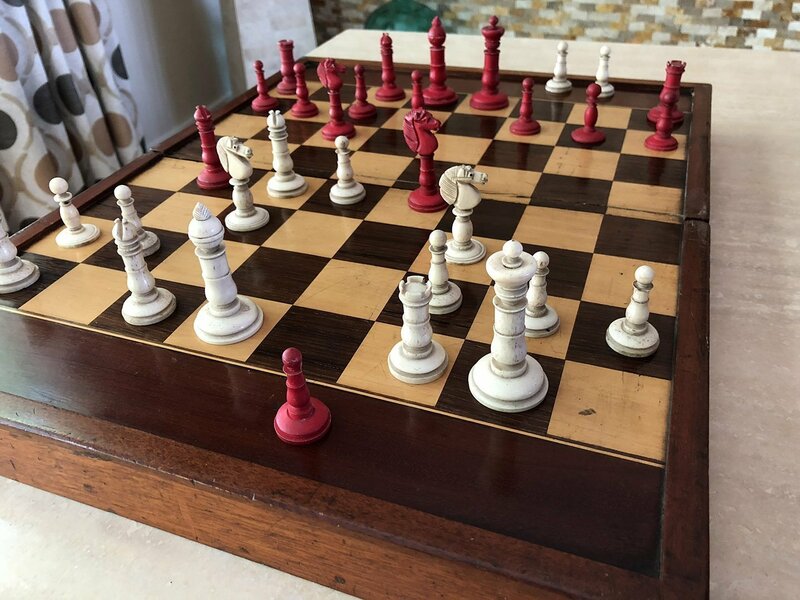 The chessmen are in excellent condition and play and display best on a chessboard with 1-3/4″ or 1-7/8″ squares. The antique chessboard shown in the images is not included in this offering, but can be purchased separately elsewhere on this website, see https://chessantiques.com/product-category/chessboards/. Northern Upright chessmen are often referred to as the Edinburgh (sometimes Edinboro) pattern, and fall into the ubiquitous English Playing set category, which also included the Saint George pattern. 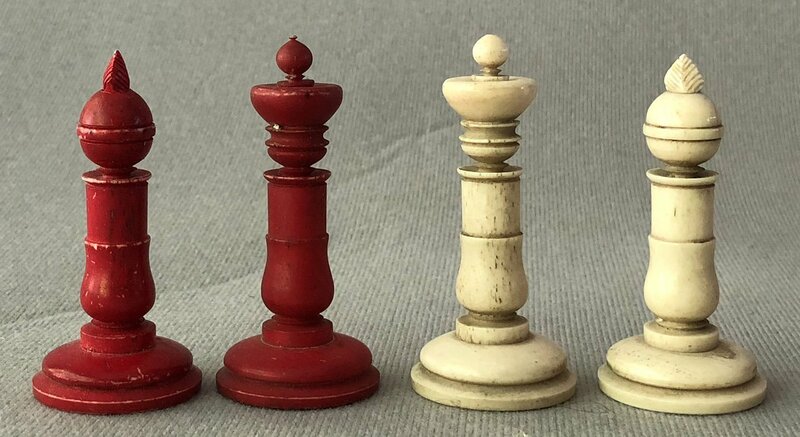 These English Playing sets were ultimately supplanted by the Staunton chessmen which were introduced to the public in September of 1849. The design of these English chessmen is attributed to Lord John Hay around 1840, although this attribution has not been rigorously established. Similar sets of chessmen were made by Dixon, Thomas and William Lund, and John Calvert as well as George Merrifield and John Jaques, among others.